International and global businesses operate in a complex and dynamic environment that is constantly changing. Communicating effectively across national borders impacts all levels of international business from packaging design, promotional and marketing channels, public relations, brand communication, customer communication and engagement, to the use of social media and provision of high-level customer support. 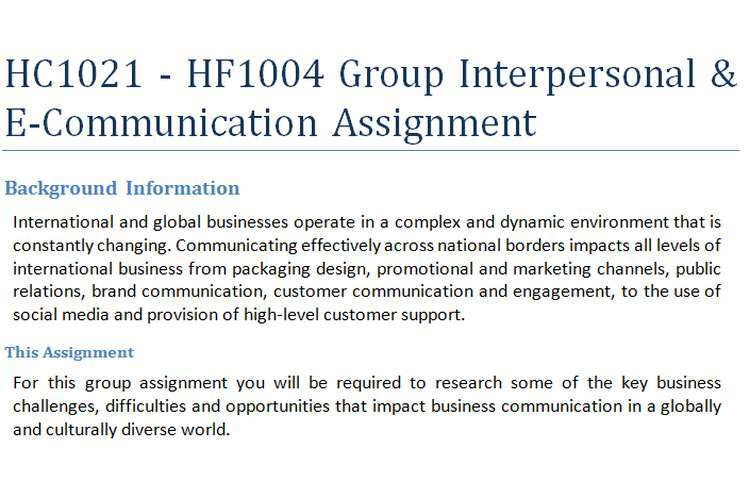 For this HC1021 - HF1004 group interpersonal & e-communication assignment you will be required to research some of the key business challenges, difficulties and opportunities that impact business communication in a globally and culturally diverse world. Groups will be required to select an international or multi-national business that operates across two very different culturally diverse countries. Groups must identify some of the key cultural and communication differences that exist in doing business between these countries i.e. what challenges, problems, opportunities and issues may occur with communication. Explain and give recommendations on how people and business can harness the diversity in the cultures when forming a business relationship. Groups will be required to perform relevant academic research and show evidence of that research within their report using standard Harvard Referencing format. At least 5 relevant academic research sources should be included in your report. An introduction and overview of the selected company you have chosen as a ‘case study’. Clearly identify which two ‘diverse’ countries it operates in that you will compare and assess in your report. Identify, compare and assess the key differences in culture and communication that exist between these two countries. Identify what business communication challenges, problems and opportunities this business may experience/or does experience in operating across these two countries. Explain and give recommendations on how people and business can harness the diversity in the cultures when forming new business relationships.